My daughter, Cadi-Elin (I call her Elin), turned six last October. She was born into this world on 31 October 2008 – a healthy 7lb 14oz. In early 2011, when Elin was two, there was a sudden change in her behaviour. My happy and contented child quickly became difficult, less engaging and less sociable. As time went on she became more and more agitated. Some may even have described her as ‘possessed’. February 2012 was the start of a long, difficult journey for all who cared and loved Elin. For example she would be walking normally then stop still, as if in a daydream. I thought nothing of this at first but it happened increasingly over the next month or two and Elin’s face would go red and she’d start to dribble. I researched seizures online and it seemed that Elin may be a victim of some form of epilepsy. The next year and a half was extremely difficult. The seizures very quickly progressed from being mild, infrequent, ‘absence’ seizures to full-on, violent ‘grand mal’ seizures. These would last a couple of minutes each. Elin was having up to 15 of these a night – and these are only the ones I could hear from my bedroom – she was actually having more! The next year and a half was spent either in the doctor’s surgery, calling ambulances or taking her to casualty… just to be listened to. I showed two videos of Elin having seizures to a duty doctor one night after Elin was, again, admitted to the children’s ward, but he put them down to night terrors! This was not the case – Elin was having seizures throughout the day. 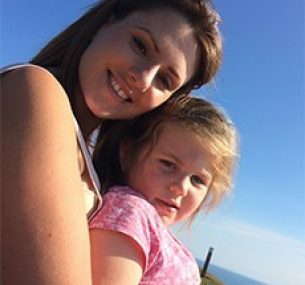 On another occasion when Elin was admitted to the children’s ward, the doctor who was on duty immediately took an interest in Elin’s case – he dealt a lot with epilepsy patients. 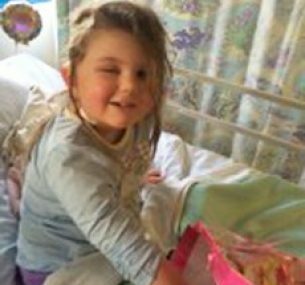 Within no time Elin was transferred to his care and was diagnosed with epilepsy. She was put on anti-epileptic drugs (AEDs). The AEDs, however, had little impact on reducing the frequency and severity of the seizures. It got so bad that Elin was not allowed to attend school in case she injured herself during fits. In August 2013, after months of asking, Elin had an MRI scan. The results came in two months later revealing a mass on the brain that was most likely causing the seizures. We had to wait until February 2014 for Elin to have a second MRI scan to see if the mass had grown since August. The mass luckily had remained the same size. Further tests showed that the seizures were starting from the area where the tumour was. This meant that Elin was a good candidate for surgery! Elin was operated on to remove the tumour on the 25 March 2014. Elin was a trooper throughout! Results of the biopsy of the removed mass showed that Elin had a Stage 2 oligodendroglioma, a type of brain tumour. As I write this account, almost a year to the day since Elin had her op, she is a different child! Her development and her participation in class activities have dramatically improved. Her behaviour has improved drastically – she is no longer permanently tired. Elin has, since the op, been diagnosed on the autistic spectrum, but she has a heart of gold and is so funny. I am so immensely proud of the way she has coped, and continues to cope, with the challenges thrown at her, and how she carries on improving. Elin has completed the weaning off one of her medications since New Year’s Eve 2014 and we are due to start the weaning off of her second and final medication on 1 April: April Fool’s Day! It’s been three years since the beginning of the roller coaster of a journey, and almost one year since we have all been able to begin a new chapter in our lives!